That's the cheery subject line on the email then-Secretary of State Hillary Clinton sent to U.S. Special Envoy for Climate Change Todd Stern just days after the Copenhagen, Denmark, climate change summit in 2009. As other leaders licked their wounds over the conference -- perceived as a failure by much of the world -- Clinton was upbeat. "I look forward to our next steps to deliver on our accord after we both get some sleep and a few days off. Thanks for all your great work," she told Stern, adding some personal family greetings to the longtime adviser whom she had tapped that year to be America's top climate ambassador. That private email and a handful of others discussing the U.N. climate change negotiations were made public by the State Department this week under a court order. The missives, covering the period from March to December 2009, are hardly explosive. They do, however, offer a window into the sensitivity of Clinton, Stern and others in the State Department to press coverage both good and bad and underscore the seriousness with which the administration appears to have treated the climate negotiations as crunch time in Copenhagen neared. 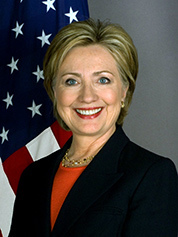 Former Secretary of State and Democratic presidential candidate Hillary Clinton. Photo courtesy of Wikipedia. On March 30, 2009, Stern alerted Clinton aides Cheryl Mills and Jacob Sullivan about positive press coverage from Reuters and the Associated Press that he felt the secretary might want to see. Back in those heady early days of the Obama administration, when the international community was ecstatic to see the U.S. re-engage on climate change, Stern was briefly the star of the climate show. The AP account, which Stern attached, recounted him telling fellow negotiators that the United States is "very glad to be back" and receiving sustained applause. The article quoted longtime environmental activist Keya Chatterjee as saying it "sent chills up my spine seeing the U.S. applauded." Mills indeed passed the stories along to Clinton, with a glowing note of her own: "Read this -- it says todd stern sent chills up someone's spin [sic] (in a good way)!" The 2009 Copenhagen summit was supposed to be the moment when more than 190 countries would come together and agree to a new legally binding agreement to address climate change. But by the time the two-week U.N. negotiating session got underway in December, it was clear to many that the talks were in trouble. After just six days in Copenhagen, Stern sent an email to Sullivan warning that things were getting sticky and Clinton's presence would be needed. "HRC should come," Stern wrote. "Danes expect all day Thursday for discussions with and among leaders to resolve open issues. Discussed this with Danish leaders today. Think this very important. This is looking more and more difficult, so I'm certainly not promising success. But bad if we don't try full out. Thanks pal." Sullivan sent Stern's note on to Clinton's private account, and she replied, "Do you think we could get anything done? If so, what?" What followed were a series of logistical emails over the rescheduling of appointments and requests from Clinton for specifics about what her role would be and how it would differ from Obama's. "Why would my parachuting in ... be determinative?" she asked. Sullivan replied that he believed the talks among leaders on the next-to-last day of the conference would be able to start to "narrow gaps on the big issues," which at the time included funding for vulnerable countries and transparency of carbon-cutting pledges. "IF (and it's a big if) those gaps are narrow-able. If they're not, then Thursday/Friday will be days of trying and failing ... but at least trying," Sullivan told Clinton. And, he warned, "Todd's view is that there is not enough time Friday for top-level meetings to close." Clinton indeed did come to Copenhagen, and declared there that the United States would help mobilize $100 billion annually in public and private funding for vulnerable countries by 2020. Her presence, which came just as the negotiations were hitting their lowest point, was widely viewed as breathing life back into the talks. A flutter of post-Copenhagen emails shows State Department officials and allies were largely pleased with themselves over the outcome. The talks ended with a political deal called the Copenhagen Accord, spearheaded by Obama and the leaders of China, India and Brazil. It lacked the legal teeth that environmental groups wanted, but Obama administration officials praised the fact that for the first time, all of the world's top greenhouse gas emitters had pledged to take action to reduce CO2 pollution. In addition to the note of thanks that Clinton sent to Stern, John Podesta -- a former and current Clinton adviser who at the time was serving as the chairman of the liberal Center for American Progress -- also emailed his kudos. "Hope you are getting a little rest after one hell of a week," Podesta wrote to Mills and others whose names the State Department redacted. "Notwithstanding some press whining, I thought BHO and HRC did a fabulous job in Copenhagen and that the schedule structure has a much better chance of success than sticking with Kyoto architecture. Congrats to all," he wrote, using the abbreviations for Barack Hussein Obama and Hillary Rodham Clinton. The only note of consternation came from longtime Clinton confidant Sidney Blumenthal, who a few days after the talks sent over a copy of a controversial article that blamed China for trying to "wreck" the Copenhagen deal. Blumenthal noted that the piece by Mark Lynas, who at the time of the negotiations was serving on the Maldives delegation, underscored in his view the need for the United States to proactively promote its own take on the Copenhagen outcome. "Any truth to this account?" Blumenthal asked Clinton, attaching the article. "The accounts from the conference have been very fragmentary, the administration has explained very little (for whatever reasons and to its detriment), and it is being widely blamed internationally," he wrote. "The broader lesson I draw from Chinese disrespect for the president (and US) on his trip (I've heard accounts from journalists), its behavior at Copenhagen, mercantilist economic policy (eg, currency), and its rough use of and contempt for international organizations, not to mention the strange form of Chinese neo-colonialism in Africa, is the need for policy review," Blumenthal went on to lecture. "Fear of Chinese retribution (economy, Iran, etc) can't be allowed to paralyze reassessment, though it should be factored into scenarios." Clinton, for her part, replied that the Lynas piece was only partially accurate. "It has some aspects right of the 48 hours I was there but not others," she said. Click here to read the first batch of private Clinton emails.